Well over the weekend I partook in an event I never thought I would, heading down to Warhammer World in Nottingham for one of their free one day AoS events. I stepped away from GW games for some 10 years and prior to the release of AoS and never thought I'd play their games again let alone travel down to their HQ for a session. 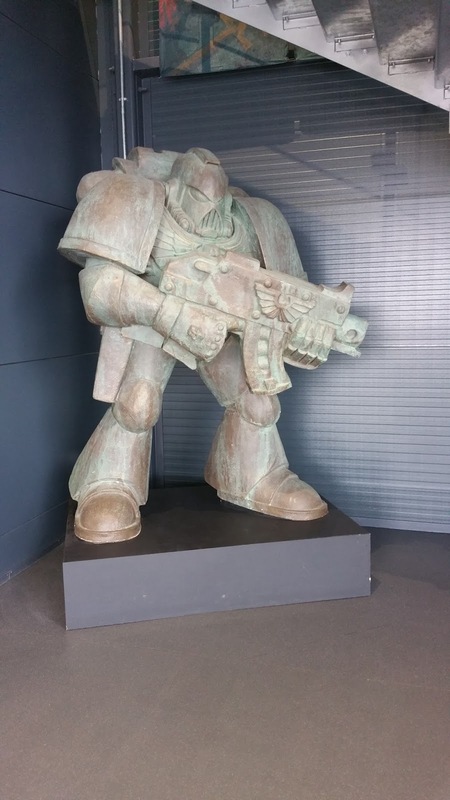 Couldn't be bothered to find the shiny Stormcast statue so here is a Space Marine in the entrance. I generally avoid any kind of organised play/tournament, many years ago when I played confrontation and infinity the usual format was tourney and I got rather sick of being pounded into the ground by players that gamed the system whilst I went for a more fluffy force. AoS has shown promise to this effect, I've seen a few reports from their events that seem pretty favourable and as it was a freebie I thought it would be good fun to head down and spread the plague a little. 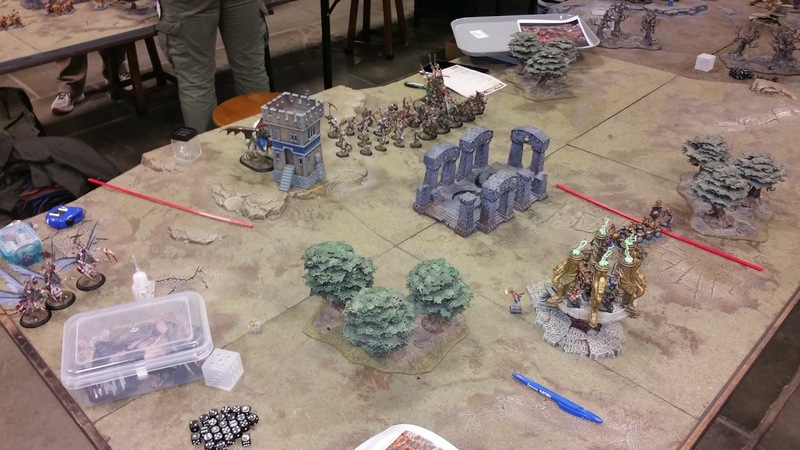 The night before the event I skimmed over the event page and spotted a few forces had been shown, there was some real filthy stuff there, if didn't look good for my forces of Nurgle so I packed everything I could that hit hard and had lots of wounds and hoped for the best. We totted up wounds he had 58 vs my 124... I did a bit of adjustment and managed to drop down to nearer 100, still it was a big difference and though I offered to try and shed some more he was keen to have a crack at it. It was a fairly predictable slaughter, the Chimera taking out a Deamonslayer with his fire breath before piling into a unit of Hammerers and munching on half of them. 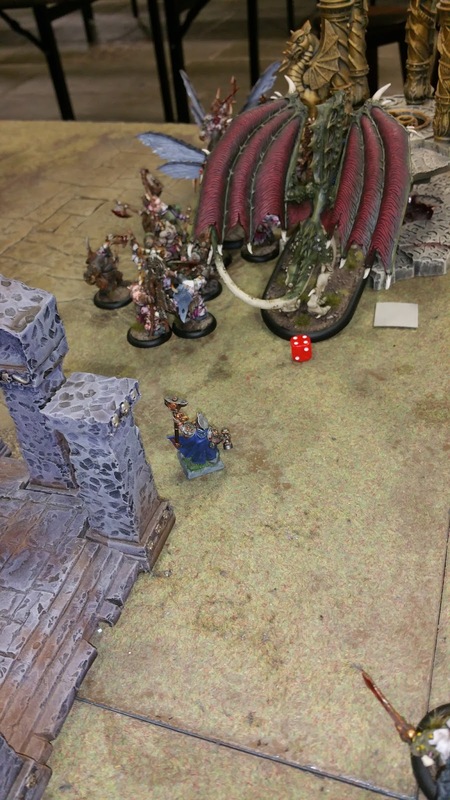 My knights hit the other Daemonslayer and after a drawn out combat killed him only for the last knight to go down with him. I felt rather sorry for the carnage caused as although the flame cannon was causing damage he only had a handful of heroes left so I suggested he may want to bring on some reinforcements and he opted to return a full unit of Hammerers to the foe. 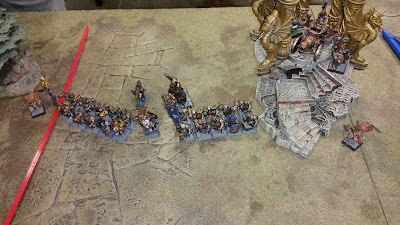 The result was painful, throwing a few buffs onto the fresh unit and the Hammerers charged into Morbidex, after a furious round of combat the mighty lord of neglected was left with just a couple of wounds, he lasted out the turn and took a chunk of Hammerers with him the following round but was eventually slain. The battle ended with a lone Runesmith facing off against half my force, he elected to make good his get away and retreated from combat securing additional laurels of victory for surviving the game. I went back in with the same list as the first game as there was only a handful of wounds in it so it looked like a pretty balanced game. He had quite a few special characters but I had Nurglings, when all else fails throw Nurglings at things and replanted your attack. The Varangard terrified me, you're essentially facing 3 chaos lords, if they hit at the same time as the Chariot I'd be losing full units at the time. Luckily for me my opponent had the worst luck with the dice, failing to get off spells, failed charges which led to his force getting out of position and leaving me time to plan and play a blocking game tying up units such as the Varangard and Archaon with my Nurglings and Plaguedrones whilst my Chimera and Blightkings cleaned up the rest of the force. I managed to keep control of the center for most of the game and taking out unit leaders scored me extra points due to the scenario, the Varangard, Archaon and the gaunt summoner all survived but I'd controlled the game well after the first turn and ensured I managed to out score my opponent. I totally feel played by this guy, he'd muttered something about this was everything he had and I took him to be a bit of a newbie at all this, taking pity I dropped a load of my big hitters and brought a bunch of Chaos Warriors in instead. In my haste to adjust my force, as I was running late into this game, I'd managed to drop a lot of the fast stuff and pretty much everything with rend. Killing Sylvaneth hiding in woods with mystic shield cast on them when you have very few attacks with rend and minimal ability to do mortal wounds is more than a little difficult. The Treelords spent much of the game with 1+ saves, the Dryads died in droves but were summoned back as fast as I could kill them. Chatting to him after the match it turns out he has several forces, this happened to be the only one fully painted. It was a surprisingly tough game. 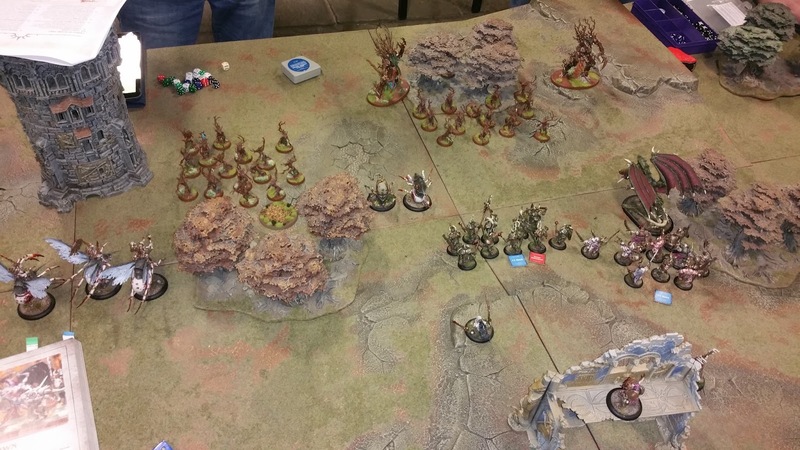 The Treelord ancient using the woods to step back and forth out of harms way whilst my army chased him back and forth. I managed a draw here, I ended up having to re-summoning the chimera for its mortal wound firebreath to take out one of the Treelords but ran out of time to take out the second. We called the game a draw at this point with only a couple of minutes to spare on the clock. With a short break we gathered back in the hall for the awards ceremony. I ended up ranking mid table at around the average score for the event. Not awful I'd lost put on a lot of points by never being the underdog. 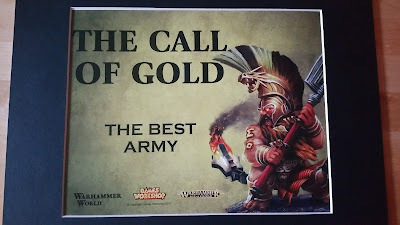 Best game catagory I gained one vote out of three, not suprisingly as my army was a little filthy and does not die easily so it can't have been much of a fun game at times. 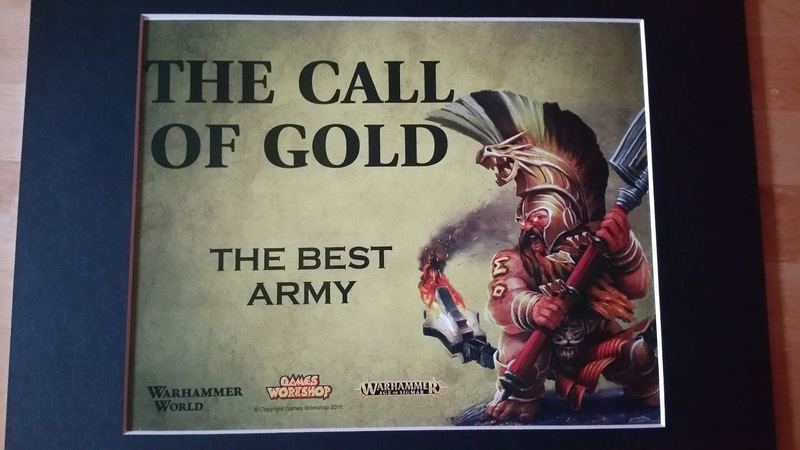 Finally catagory was best army and I'd been nominated before lunch. 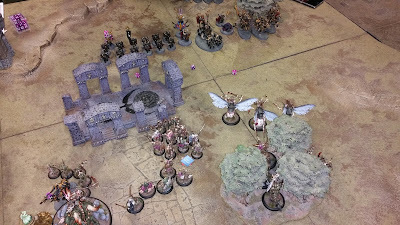 I was up against 2 Stormcast armies which were nice and a really nicely painted death force. I'd had a lot of really positive comments throughout the day about my force and was hoping that the considerable conversion work would boost the forces appeal. Yup, I won the best army award, it's really nice to be voted a winner by fellow hobbiests, I've set the bar high so next time I'll have to do something equally special. I really enjoyed myself, the event was well organised, the staff friendly and really enthusiastic, always on hand for queries etc. The venue is great and as they insist on all models being painted it's a thrill to play on a nice table with fully painted forces. I was totally expecting the "win at all costs" attitude and unfortunately I'd packed my army with that in mind. I had some wiggle room but with half the force being very high wounds and selected for particular tasks it was hard to move the force around to suit the game whilst maintaining a broad spread of abilities, as could be seen in the last game. The battle plan for the event worked well, it really penalised you of you brought a large force, mine could range between a martial strength of 90 and 140. Most of the other forces were in the 60-100 range with a couple of exceptions so I did feel I was being a bit filthy here, not a lot I couldn't do on the day as the only unit I had with 1 wound models was my Plaguebearers, everything else was multi wound with a lot of my models being 5 wounds each. The only thing not accounted for in the pack was the effects of summoning, theoretically you could summon 15 more monsters during the game if you wanted too so go in with a small force and swing it back during the first turn. There also isn't a lot of accounting for synergies, Lord Kroak and astrology bearers plus eternity warden pretty much guarantees you a lot of kills. I'll certainly go again and try and convince Charlie or my bro to come down as it was a worthwhile event for the price of lunch. I'd even consider paying for one of the 2 day events though that becomes more difficult with the young kids.